Tara Lipinski, a longtime Michael pal, has added some new candids to her website! July 2010: Move those women so we can see him properly! Tara is friends with Chris too! 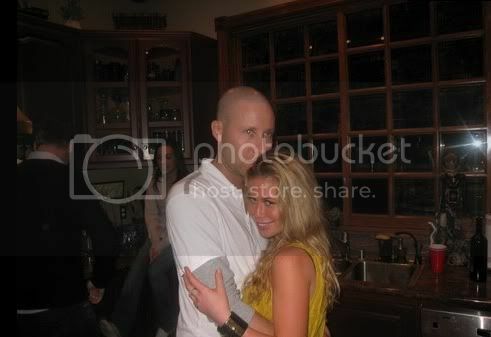 Here's a quote from her blog in 2005: "A week ago, Chris and another friend Michael and I, went shopping. When we were done, we headed to Michael's house and sang Karaoke in his basement. It's a good thing it is in his basement and not in public because I am horrible. It was nice to see Michael. He comes in and out of town when he is working on his show but hiatus is coming up and he'll be staying in LA. He always has really fun parties. We do lots of group stuff like bowling in the winter and volleyball on the beach when the weather is warm." Aw, he's buttoning her up! Michael & Jensen hangin' at the airport! Hi boys! Found via TWoP. All of Tara's photographs can be seen at TaraLipinski.com Click on "candids."